76% of Reception children achieved a Good Level of Development (expected or exceeded grade in all Prime and Literacy and Numeracy areas) compared to 87.1% last year. This year 78% of girls achieved a GLD and 75% of boys achieved a GLD. Last year the National Average for a GLD was 70.7%. This year the Average Total Point Score is 40.8. The average point score for girls is 42.64 and boys is 39.19. Last year the gap in average point score between girls and boys was 1.31. This year our girls score is 3.45 points higher than boys. Average Point Score for Summer Birthdays this year is 39.69 and Non-Summer Birthdays is 41.65. Last year’s school average point score was 40.54. Last year’s National Average Point Score was 34.5. 97% of children passed their Phonic Screening Test. This is an unprecedented score and gives us great confidence in the effectiveness of our new style of phonics instruction. The threshold for a pass was 32/40 and our average pass was at 37.8. The child who did not pass was identified as struggling in phonic development and is receiving 1:1 support in reading partnership and also access small group intervention. She will re-take the test next June. Of the 3 children who did not pass last year, I child (who is SEND for speech and language) has passed. One child who did not pass has a single plan and will continue to have support in all areas, including phonics. The other is a vulnerable learner who is receiving additional support and will continue to be supported in her phonic development. The average scaled score for maths is not available due to some children having an outcome of ‘N’ – no scaled score. This skews the mean and makes it incomparable. The average scaled score for reading is not available due to some children having an outcome of ‘N’ – no scaled score. This skews the mean and makes it incomparable. 73% of children achieved expected levels or more.  * A ‘high standard’ refers to the child’s achievement of a scaled score of 110 or above. The one child who did not reach expected standards had accessed intervention all year and is almost at age related expectations. Neither of the two children who did not reach expected standards were SEN. Both have performed well all year and passed previous years’ tests under exam conditions. Of the 5 children who did not achieve expected levels, 4 are registered as SEN.
Of the two children who did not achieve expected levels, one has a Single plan for spelling and the other is lower ability with issues of with independence and maturity. 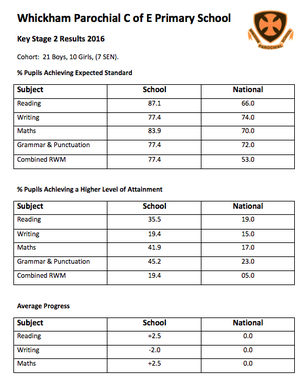 77% of children) reached the expected standard across Reading, Writing and Mathematics (National 61%). To measure progress, children nationally were put into finely graded groups according to their KS1 attainment. The KS2 scores of each child in the groups were then turned into an average and each child from the group was compared against this average. Their progress is not reported individually, but each child gets a progress score – typically anything between -5 (5 points less than the average for their group) and 5 (5 points over the average for their group). These scores are then collated and averaged to give a progress score for the school in each subject. 87.1% of Reception scored at or above last year’s National Average point score of 34.5. The average Total Point Score for the cohort was 40.45. A Good Level of Development (expected or exceeding grade in all Prime and Literacy and Maths areas) was achieved by 83.3% of girls and 92.3% of boys. The National average for GLD was 69.3%. 90% of children achieved the expected standard in Year 1. 3 children resat the test in Year 2 and achieved the expected standard. 84% of Reception children scored at or above last year’s National Average Total Point Score of 34.3. The Average Total Point Score for the cohort is 42. A Good Level of Development (expected or exceeded grade in all Prime and Literacy and Mathematics areas) was achieved by 77% of the cohort. The National Average for GLD was 66% in 2015. 90% of children passed their Phonic Screening Test compared to 80.5% Nationally and 79.7% in Gateshead LA. Of the 3 children who did not pass, 1 was absent and has subsequently taken the test. Of the 8 children who did not pass last year, 2 have passed this year. 4 of the 6 children who have not passed are on our SEN register and all of these children will receive additional support to access reading and writing in Year 3. 73.3% of children achieved expected levels or more, compared with 72.6% Nationally and 74.4% in Gateshead LA. 30% of children demonstrated greater depth in their maths, compared with 17.8% Nationally and 20.5% in Gateshead LA. 73.3% of children achieved expected levels or more, compared with 74% Nationally and 76.7% in Gateshead LA. 30% of children demonstrated greater depth in their reading, compared with 23.6% Nationally and 27.9% in Gateshead LA. 66.7% of children achieved expected levels or more, compared with 65.5% Nationally and 69.1% in Gateshead LA. 26.7% of children demonstrated greater depth in their writing, compared with 13.3% Nationally and 17.5% in Gateshead LA. Of the 10 children who did not reach expected levels, 7 are registered as SEN.
63.2% of children reached the expected standard across Reading, Writing and Mathematics, compared with 60.2% Nationally and 63.6% in Gateshead LA. 23.3% of children reached a ‘higher standard’ across Reading, Writing and Mathematics, compared with 8.9% Nationally and 12.1% in Gateshead LA. 83.9% of children achieved expected levels compared with 70% Nationally and 76% in Gateshead LA. 41.9% of children achieved a higher standard compared with 17% Nationally and 18% in Gateshead LA. 87.1% of children achieved expected levels compared with 66% Nationally and 71% in Gateshead LA. 35.5% of children achieved a higher standard compared with 17% Nationally and 18% in Gateshead LA. 77.4% of children achieved expected levels compared with 74% Nationally and 82% in Gateshead LA. 19.4% of children achieved greater depth in their writing compared with 15% Nationally and 18% in Gateshead LA. 77.4% of children achieved expected levels compared with 72% Nationally and 77% in Gateshead LA. 45.2% of children achieved a higher standard compared with 23% Nationally and 25% in Gateshead LA. 77.4% of children (all non-SEN) reached the expected standard across Reading, Writing and Mathematics compared with 53% Nationally and 61% in Gateshead LA. 19.4% of children reached a ‘higher standard’ across Reading, Writing and Mathematics compared with 5% Nationally and 7% in Gateshead LA. 83% of Reception children scored above last year’s National Average Total Point Score of 33.8. The Average Total Point Score for the cohort is 42. A Good Level of Development (expected or exceeded grade in all Prime and Literacy and Mathematics areas) was achieved by 73% of the cohort. The National Average for GLD was 60% in 2014. 70% of children passed their Phonic Screening Test. Of the 9 children who did not pass, 5 have special educational needs, 2 have summer birthdays. These children will be the focus of additional support in Year 2. Of the 7 children who did not pass last year, 4 have passed this year. Two of the children who did not pass are on our SEN register. They have made very good progress, and have received, and will continue to receive, considerable teacher and TA intervention. 77% of children achieved level 2b+. 19% of children achieved Level 3. 67% of the children met or exceeded their personal targets. 71% of children achieved level 2b+. 25% of children achieved Level 3. 84% of the class met or exceeded their personal targets. 65% of children achieved level 2b+. 6% of children achieved Level 3. 45% of the class met or exceeded their personal targets.